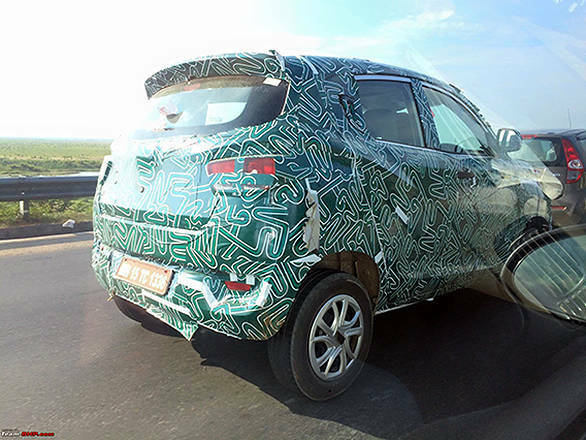 Mahindra have been testing its sub 4-metre compact SUV codenamed S101 for quite some time. Reports say that the car will be called XUV100. 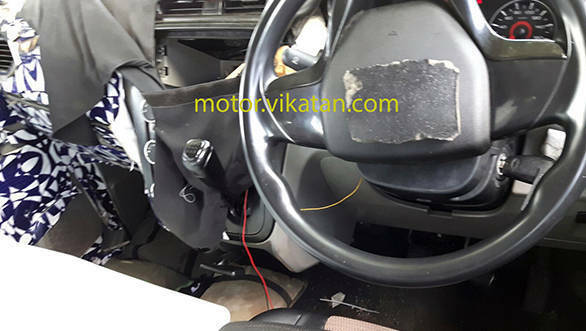 A recent spy image car has a three-spoke steering wheel, space for 2-din music system and rotary knobs to operate the AC. With the dash-mounted gear lever and the handbrake with a pull mechanism under it, it is clear that the front row is designed to fit in three passengers, similar to the Datsun Go. Recently, another test mule was spotted with wheel-caps. This car could be one from the lower trims and we expect the higher trims to get alloy wheels. The rear door handle is also mounted near the windows, a la Chevrolet Beat. With a tall stance and a new monocoque chassis inspired from the Mahindra XUV500, the XUV100 should compete against the cross-styled hatchbacks currently available in the market, which includes Fiat Avventura, Volkswagen Cross Polo, Hyundai i20 Active and Toyota Etios Cross. It will also compete with the Maruti Wagon R and Celerio hatchbacks. 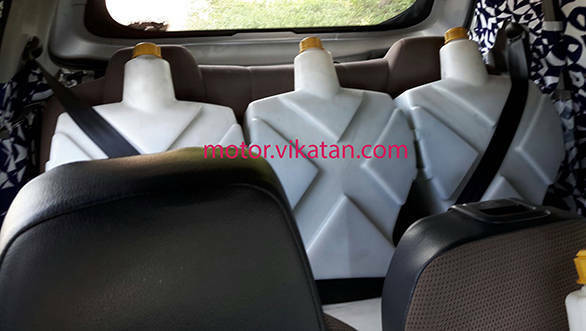 The new Mahindra XUV100 is expected to be launched with a new 1.2-litre petrol engine and the diesel engine borrowed from the TUV300. Mahindra may also offer a diesel AMT as an option along with a 5-speed manual. The XUV100 is expected to be priced around Rs 5 lakh.